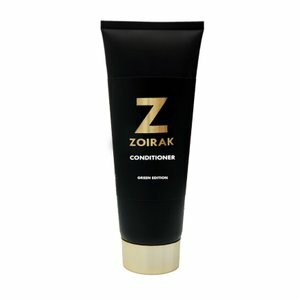 For Zoirak´s products we prefer to use cold pressed oils only. Most oils turn rancid and lose all their benefits when exposed to temperatures exceeding 125 degrees. By using cold pressed oil, we can ensure that the oil will retain all of its nutritional value. The oil contains zero grams of trans-fatty acids and is naturally cholesterol-free. Cold pressed oils are good for both cosmetic products and skin care. Cold pressed oils will help to improve your health, skin, and hair. When scientists tested a commercially available cold pressed formula, they found greater quantities of antioxidants leading them to declare that cold pressed oil is superior to others in terms of potential health benefits. Zoirak chooses to use cold pressed oil to help you live a healthier life. In addition to being non-toxic, we wanted or products to be as natural as possible as we care about the environment in which our products are produced. Since our focus is entirely on organic production, there are no hazardous chemicals involved, from the cultivation of raw materials to the manufacturing processes used. These natural products are not harmful to your health, nor will they damage our environment—when you rinse our products from your body, they will return once more to nature. Even though we are all about using natural products, we do have to be completely transparent on one thing; in some of our products we had to add a very small amount of chemicals in order to produce a foaming effect. None of these chemicals are dangerous in any way of course, and appear in standard products such as shampoos and soaps. These chemicals do not exceed 5% and you can feel perfectly safe while using our products. Bear in mind, however, that there is not going to be much of a foam party in the shower. This is because we chose to cut down on unnecessary chemicals such as sulphate, despite some cosmetic companies’ claims that these chemicals are necessary. In spite of this, our products will excel in getting the job done—we can promise you that! Black sesame oil has many beauty benefits, especially when it comes to the skin, scalp and hair. It can strengthen your hair from the roots, giving them a deep nourishment. One of the major factors that has prevented the widespread use of sesame oil is the costly process that must be carried out in order to extract the oil from its seed. 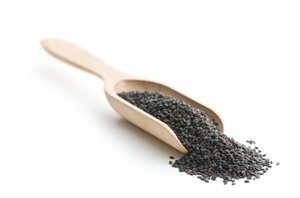 Black sesame seeds are very rich in minerals and vitamins such as vitamin E, vitamin A, copper, manganese, calcium, magnesium, iron, zinc, phosphorus, vitamin B1, amino acids, selenium, dietary fibre, and the linoleic acid that gives the sesame oil its antibacterial and anti-inflammatory properties. Despite their relatively small size, these seeds contain an abundance of natural antioxidants. Research suggests that the presence of antioxidants in black sesame seeds can neutralise the effects of damaged cells. Example benefits include swift healing of wounds, reduction of the effects of ageing (including grey hair) and pimples, and helping to prevent skin rashes. The oil is easily absorbed, providing the necessary nutrients to give your skin a silky softness. In traditional Chinese medicine it is also believed that black sesame seeds have great therapeutic properties. They are said to encourage hair growth, retention of hair pigment, and to provide a natural protection against sunlight for both your hair and your skin. The kaffir lime—or Thai lime—is a tropical fruit that is native to various parts of Asia. 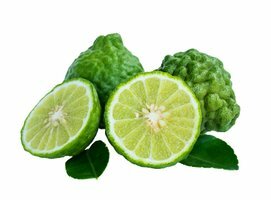 In addition to its frequent use in Thai cuisine (such as Tom Yum soup), the kaffir lime is also highly respected within herbal medicine. This is due to its abundance of beneficial organic compounds and their positive effects on the body. The kaffir lime is used for many different purposes. Both its juice and other extracts are mixed into countless cosmetic and bath products in order to capitalise on its unique scent and antioxidant properties. The oil is a fantastic hair and scalp cleanser, preventing dandruff while improving both its appearance and shine. In addition, the fragrance of the leaves can be rejuvenating and scientists have claimed that kaffir lime oil can be used in aromatherapy to relieve depression, anxiety, and fatigue. Some of the acids found in kaffir limes can help to neutralise free radicals and the dangerous by-products of cellular respiration that are known to cause cell mutation, apoptosis, and cancer. Antioxidant compounds can also slow the breakdown of cells, helping to minimise the appearance of wrinkles, scars, and pimples. If you want your skin to look healthy and fresh well into your old age, then perhaps some kaffir lime juice is precisely what you need! 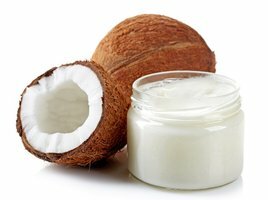 Coconut oil has been used for beauty purposes since ancient times, and today it remains one of the most popular products within the cosmetics and beauty industries. Since it is rich in antioxidants and has antiviral, antifungal, and antibacterial properties, coconut oil is exceptionally good when used on skin and in hair. When used in hair, coconut oil can improve scalp condition, fight infections and fungus, encourage hair growth, prevent hair loss and breakage, and add volume, all while giving the hair a healthy glow. Coconut oil is a better conditioner for your hair than any equivalent synthetic product available on the market. Coconut oil has a high capacity for retaining moisture and will keep your skin and hair soft and well hydrated. It also helps to minimise various types of skin irritation and outbreaks. The variety of fatty acids present in coconut oil also serves to make it a far better agent than any other found in regular anti-dandruff shampoos. Frequent use of coconut oil can help you to eliminate your dandruff entirely. In addition to all its health benefits, coconut oil has a sublime fragrance; you may even find yourself wanting to take a bite, though it won’t taste quite the same as its alluring aroma!